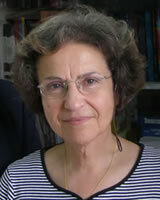 “ Maria Mimikou is Professor in the School of Civil Engineering of the National Technical University of Athens. Emeritus Professor NTUA, School of Civil Engineering, Department of Water Resources and Environmental Engineering. High expertise in the area of hydrology and environment, water resources management, climate change, hydroenergy. Scientific Responsible and Coordinator of European and National Competitive Research Projects.